Light Touch and Great Tone.. I have used a lot of picks over the years but finding a pick that produces a full tonal quality while allowing a light touch without dropping it has seemed impossible. 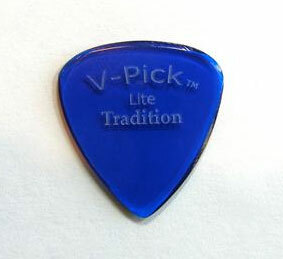 The V-Pick Tradition Lite really delivers the deep full tone of my guitars and allows me to hold the pick lightly between my fingers allowing for much more articulation and expressiveness. The Sapphire Blue color is fabulous.